For all you coffee lovers out there, the most pristine cup of joe will soon be available to you, cruelty-free. One of the most expensive coffees in the world (one cup costs more than the shirt on your back), civet coffee, can now be produced sustainably and humanely thanks to synthetic biology. In the past, civet coffee was produced in an oppressive and cruel manner. The hot java comes from coffee beans that have gone through the digestive tract of civets. Civets are small mammals that reside in Southeast Asia and defecate one of the smoothest coffee brews known to man. As demand for the coffee has risen, civets have been captured and forced into cages for the production of coffee beans. Camille Delebcque, a synthetic biologist, visited a civet farm that inspired him to find a new way to produce the exquisite coffee beans. After experimenting with a fermentation process for creating the coffee beans in his kitchen, he teamed up with a food scientist, Sophie Deterre, and started a company called Afineur. Their company has found a way to mimic the digestion process that occurs in the civet’s gut. 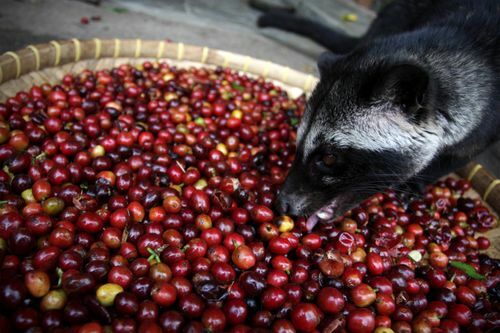 In the original process, the coffee beans are digested and pass through the civet, ending up less bitter because of the protease enzymes in the animal’s gut. Delebcque’s process for altering the coffee involves designed bacteria that can ferment the beans in roughly two days, which also removes the bitterness. Synthetic biology will now allow coffee companies to expand their flavoring abilities. “Traditionally, coffee producers have had two ways to control the final product: choosing the beans, and determining the time and temperature of the roast. Fermentation adds a third possibility for creative control”, Delebecque says. Not only will coffee flavors increase but also the flavors of other beverages that are fermented, like wine and beer. As an enthusiast of all these beverages I’m very excited for the future of my taste buds.